Daniel Sedin may have been the only member of the Vancouver Canucks in Nashville over the weekend for the NHL All-Star Game, but the tenured forward was joined by a couple familiar faces, albeit ones that are often covered by masks. Goaltenders Roberto Luongo and Cory Schneider were on the ice over the weekend as well, the former one of three Florida players guided by Panthers head coach Gerard Gallant as part of Team Atlantic, while the latter was the lone New Jersey representative at the event and one of the two netminders for Team Metropolitan. Both deserve to be there on merit. Luongo has a 22-13-4 record for the surprising Panthers and boasts the fifth-best save percentage in the league, the sixth-best goals against average and has picked up four shutouts, good for third in the league. Schneider, who spent a few years as the understudy to “Bobby Lou” on the West Coast, is first in games played, third in goals against average and level with Luongo in the wins (22) and shutout (4) departments while playing a major part in keeping the relatively anonymous New Jersey Devils in the playoff hunt. Both stand as shining examples of miscalculations and decisions gone wrong for the Canucks. Even though it was Luongo who requested a trade and was at the center of a goaltending controversy, it was Schneider who was the first to go. Shipped to the Devils for a first-round pick that turned in Bo Horvat at the 2013 Entry Draft, the Boston College alumnus had unseated Luongo as the top man in Vancouver, playing exceptionally well in spurts during the course of three full seasons as his back-up before taking over for him in the playoffs. He was 26 when the Canucks shipped him out and he instantly became the heir to the crease in New Jersey, making the legendary Martin Brodeur expendable after one season as his backup. Nine months later (and a day before the trade deadline), Luongo was finally jettisoned, sent back to Florida for forward Shawn Matthias and goaltender Jacob Markstrom. Despite having backstopped the Canucks to within one game of hoisting the Stanley Cup and being universally regarded as one of the best goalies in the NHL, the fans in Vancouver and the organization soured on him and he became the guy that had to go. Now, both Luongo and Schneider are representing their squads at the All-Star Game, while the man the ultimately replaced them both in Vancouver, Ryan Miller, watches from home, enjoying a break from what has been his arguably the worst season of his career. One of the ironic elements in this game of musical chairs between the pipes in Vancouver is that while fans were critical of Luongo’s hefty price tag, he actually makes less this season than their current keeper, while Schneider has the exact same cap hit as Miller ($6M) while being six years his junior. Each of these moves felt like a misstep at the time and only look worse as more time passes. The Luongo situation never made any sense – he was one of the best goalies in the league and had won 224 games in his first six seasons in Vancouver (37 per year on average), but a couple early playoff exits (after reaching the Stanley Cup Finals) fell on his shoulders and his shoulders exclusively. Rather than part ways immediately, the Canucks let it fester and ended up getting $0.25 on the dollar when it reached a point where they simply had to move Luongo. 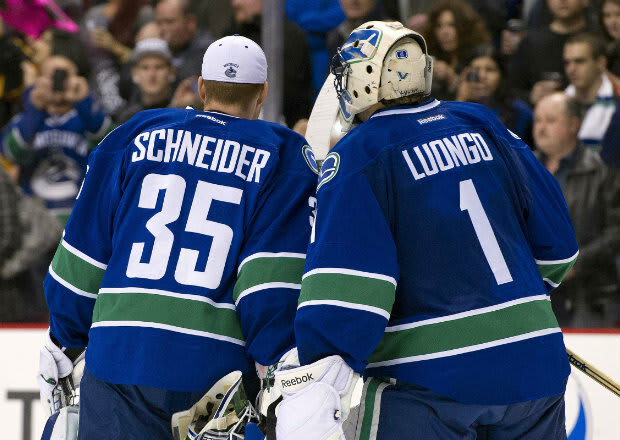 Parting with Schneider made even less sense since it came in the midst of the whole “Luongo Has Got to Go” debacle. Sure, he was a better asset and garnered a Top 10 draft pick in return, but he was also a franchise goalie in the making and given that everyone agree Luongo was no longer that guy, how in the hell do you jettison a 26-year-old replacement? Bringing in Miller the following offseason only exacerbated the situation because for all the strong seasons he posted in Buffalo, the Michigan State product had just flamed out in St. Louis. Maybe you can’t predict how things are going to play out, but replacing Luongo with Miller was nothing more than a lateral move at the time, especially after having bailed on Schneider. Stability and consistency between the pipes is crucial to team success in the NHL. Florida and New Jersey have that and they have the Canucks to thank for that.